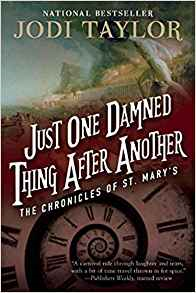 Just One Damned Thing After Another by Jodi Taylor ushers us into the world of time travel. At St. Mary’s these archaeologists are trained to look at history a very different way. Perhaps a combination of Indiana Jones meets Dr. Who (though I don’t know anything about Dr. Who so my comparison may be off). Our story introduces us to Madeleine Maxwell and her class of new recruits. The life expectancy of these “historians” seemed a bit short as they often jumped into the middle of some historic crisis. Trying not to alter history while having human compassion was often at odds on a mission. This was an interesting read as there were a lot of twists and turns…and time travel! This article was published on Jan 21, 2019 . It is tagged jodi taylor, Just One Damned Thing After Another, st. marys. You can follow any responses to this article through the comment RSS feed.